I play the maid a lot, or one the lower sort, both at home and abroad. 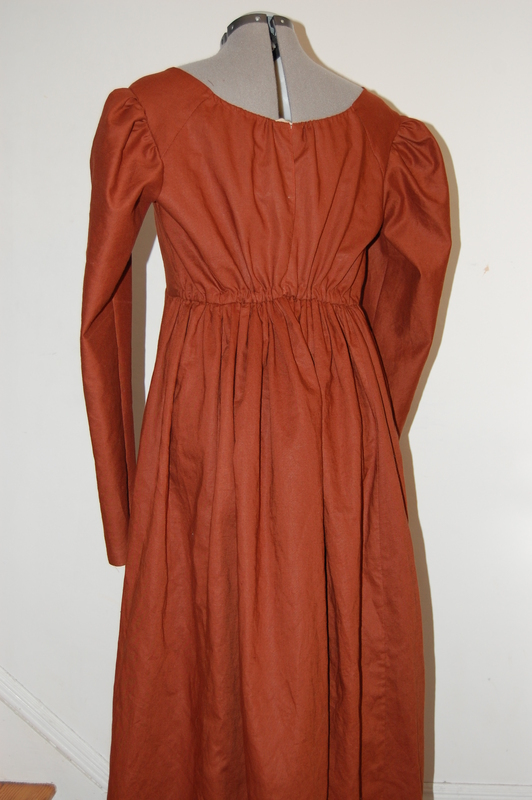 I’ll be a maid in Newport again this February, and for that event, I’ve made the skritchy rust brown gown. Not quite finished, it still requires hemming and something to finish the sleeves, but in three days, I got pretty far, considering. This back-closing bodice with bust darts was pretty awful to fit– strange relationships developed between the bodice neckline and a waistband now discarded and on its way to Johnston. The back closes with a drawstring at neck and waist, as simple as possible. Mr S and I discovered that fitting a bodice back was deleterious to our relationship, so drawstrings won over buttons. I can tie the lower string, but not the upper– annoying, as I was trying to make a gown that was easy enough to put on solo at 4:30 AM. Vanity won over a pinned apron front gown, though I know they exist in Rhode Island collections. The skritchy rust-brown cotton pays homage to that extant garment, which is a rough homespun brown wool. I may not be stylin’ extant, but I’ll be itching correctly. It may be itchy, but that’s one of my favorite colors that I can’t wear well 🙂 Look awesome in it for me! I hope I will be awesomely maid-like. 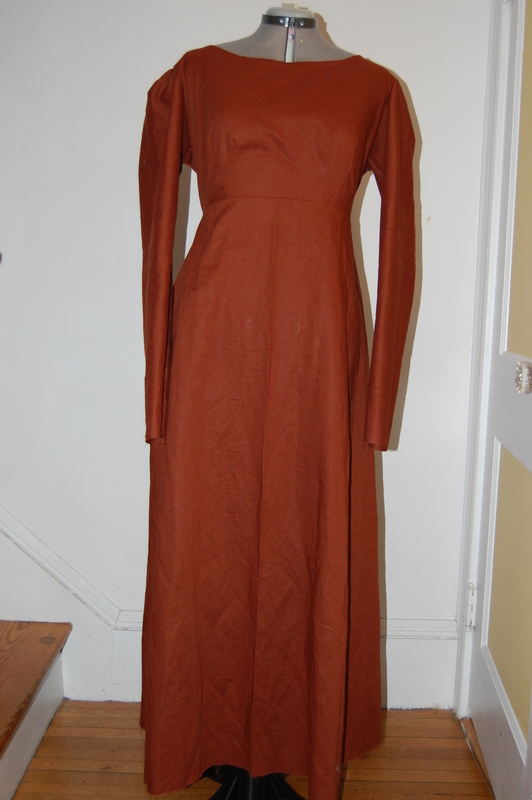 I’m thinking about a black apron, though linen and not taffeta like Sabine’s. It’ll be a very different look, which seems right for a new decade. If the neckline is open enough to allow your head to pass through, which it appears to be, just leave the neckline string tied at the ideal position and undo/tie the waist. I discovered that’s the easiest way for me to get in and out of my back-tying gowns unassisted. I’ll try that, thanks! The neckline is definitely large enough for my head!